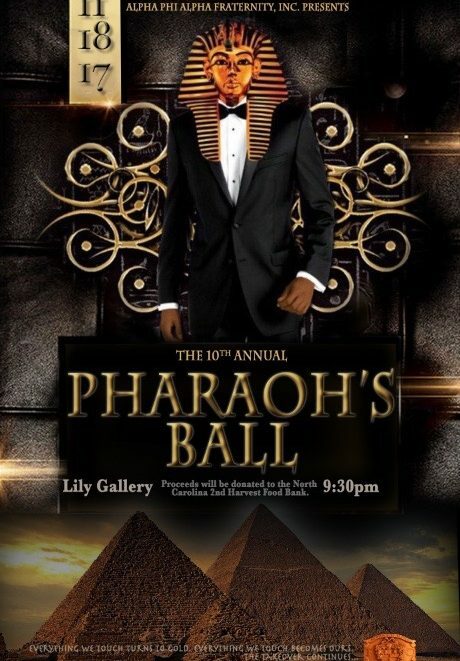 Tau Omicron Annual Pharaoh’s Ball – Alpha Phi Alpha Fraternity, Inc.
On Saturday, November 18th, from 9:30 PM to 1 AM, The Tau Omicron Chapter of Alpha Phi Alpha Fraternity, Inc. is hosting their 10th Annual Pharaoh’s Ball in the Lily Gallery at Davidson College. There will be a DJ, music, food, drinks, and a performance by the Brothers of the Tau Omicron Chapter. The Pharaoh’s Ball is the chapter’s biggest Philanthropic event and the chapter partners with Second Harvest Food Bank to help raise money to purchase donations for families in the area during the holiday season. All of the ball proceeds go directly to the organization. Last year, the chapter was able to donate 3500 lbs of food to families in need in the area. The goal is to either match or surpass that total this year. Tickets for the event will be $7 for Brothers of Alpha Phi Alpha Fraternity, Inc. The following EventBrite link is for ticket purchases: https://www.eventbrite.com/e/pharaohs-ball-tickets-39859353399. Venmo donations are being accepted. Send them to the chapter Treasurer, Bro. Sawyer Levy: @Sawyer-Levy. Any contributions help as we are attempting to do our best to help families in the area have food and resources during this upcoming holiday season. If your respective chapter would rather send a check or donate via other means, please contact Brother Shassata Fahim (shfahim@davidson.edu) or the Chapter’s President, Bro. Allen Clay Jr. (alclay@davidson.edu).